Our good friend Rob Schuster from Colony of Gamers was at PAX 2010 this past weekend and got some hands on time with Portal 2's co-op mode. He wrote some hands on impressions, almost all of them positive, giving us the goods on our robot duo's adventures through science. There's going to be a lot of new tools at your disposal in Portal 2, above and beyond just placing turrets and portals around a level. There's something called a Light Bridge which can be extended through portals, a Thermal Discouragement Beam that's a "blazing laser of death," a Refractor Cube to redirect the beam, and a new type of switch that only activates when the beam is directed through it. One thing that worried us was just how hard the game would be - and how forgiving it would be with all those inevitable deaths. 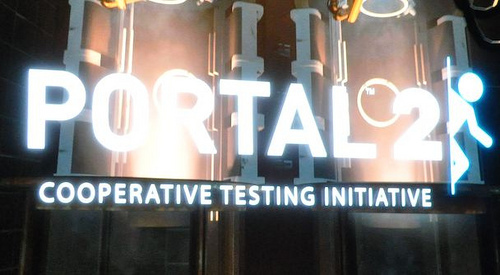 After all, Portal was all about trial and error. Thankfully it looks like the game is going to handle it quite gracefully...with plenty of hugs. Accidentally drop your partner into a pit filled with spikes? Fear not, another version of him will drop from a spawning tube and you can hug it out. Each time my partner died, they would respawn instantly meaning there was no break in the action. While the gameplay may include a healthy amount of trial and error when perfecting your solution to a puzzle, there was no silly constraints on spawn times or requirements that we start from the beginning of the level. The final verdict? 15 minutes was an absolute tease.